Despite not having an NBA license, Upper Deck is still moving ahead with its SP Authentic brand using college content of former and current stars. 2011-12 SP Authentic Basketball mixes stars and hits from several generations, giving a modern feel to a retro theme. Although the lack of NBA lisence might make the traditional base set less compelling to some collectors, it does give Upper Deck the opportunity to flaunt their exclusive autograph contracts with Michael Jordan and LeBron James and surround them with some of the game's other all-time legends. Like other recent hoops sets from the company, 2011-12 SP Authentic Basketball promises great odds on getting a signature from one or both of the mega-stars. Another prominent feature of the set is cards embedded with pieces of floor from Carmichael Arena where Jordan spent his college days as a Tar Heel. 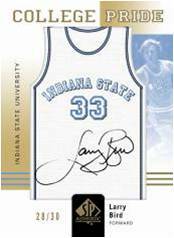 Collectors will find three autographed and/or memorabilia cards in every 2011-12 SP Authentic Basketball box. Base set: 160 cards (50 base cards, 50 SP Flashback Rookie F/X, 60 SP By the Letter Autographs). SP Flashback Rookie F/X cards (50-card subset) give a retro look to the trademark subset. SP By the Letter Autographs (60-card subset) see the return of manufactured patches, each containing signatures. 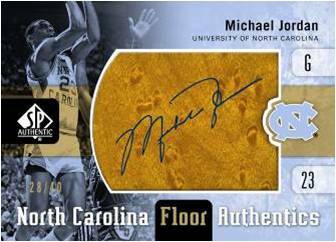 Inserted one per box, North Carolina Authentics Floor Cards offer basketball court pieces from Carmichael Arena where Michael Jordan and others suited up for the University of North Carolina Tar Heels. 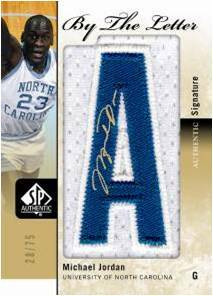 Autographed parallels feature signatures from Michael Jordan, James Worthy, Sam Perkins, Kenny Smith and others. College Pride Autographed Jerseys (numbered) mix signatures with the subjects alma mater. Sign of the Times Dual, Triple and Quad Autographs (numbered). Every 12-box case is guaranteed to include either a Michael Jordan or LeBron James autograph in one of the six-box inner case. 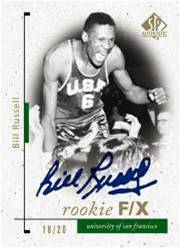 The other inner case will have an autograph of either Jordan, James, Larry Bird, Bill Russell, Magic Johnson, Julius Erving, Derrick Rose, a first-tier Rookie F/X, or a second-tier Rookie F/X subject.